If you do any baking, I'm sure you've seen recipes that call for 'three medium eggs' or '2 large eggs'. But what does that mean? 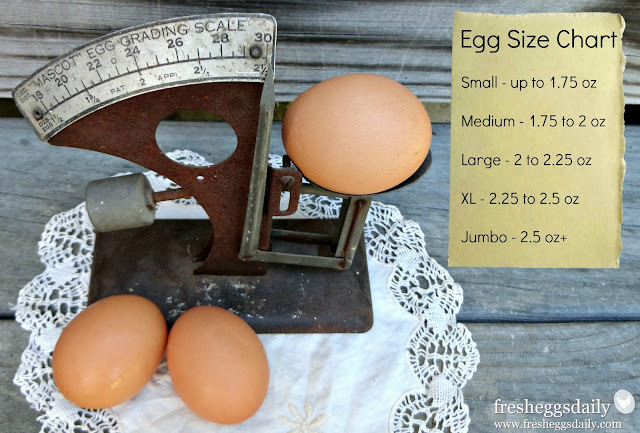 And how do your fresh eggs from your chickens measure up? Well, I'll tell you. Did you know that commercially sold eggs are weighed by the dozen, not by the individual egg? So there can be some variance from egg to egg within a carton, as long as the aggregate weight of the carton is consistent with the guideline for that egg label. So how can you figure out what size your chickens' eggs are? The easiest way is to use a postage scale or food scale to weigh them. One you have the weight of each egg in ounces, put it in the proper carton and label the cartons. Then double check at the end to be sure each carton weighs in at the proper weight. Most small scale sellers at farmers markets or at a roadside stand aren't required to size (or grade) the eggs they sell. Check with your state Egg Laws, but likely you aren't required to package your eggs by size - even though its kind of fun to weight your eggs just to see where they stand. Especially if you collect a double yolker, which can weigh in over 4 ounces! One final comment. Even though a recipe may call for a Medium egg or a Large egg, I have never worried about the actual weight of one of our chicken eggs. And I've often subbed in duck eggs which are about 30% larger than a chicken egg - even recipes when I'm baking - and never had any problems. Since there's such a slight difference in size in the chicken eggs, I don't think it much matters honestly whether you use a medium, large or even jumbo egg in most recipes.